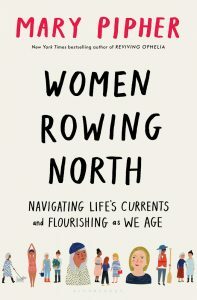 Women Rowing North offers a timely examination of cultural and developmental issues women face as they transition from middle age to old age. In life stage, women contend with ageism, misogyny, and many kinds of loss. Yet, contrary to stereotypes, most older women are deeply happy and filled with gratitude for the gifts of life. Their struggles help them grow into the authentic, empathic and wise people they have always wanted to be. 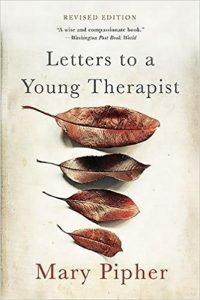 In Letters to a Young Therapist, Pipher shares what she has learned in thirty years of clinical practice, helping troubled families, alienated adolescents, and harried professionals restore peace and beauty to their lives. Through an exhilarating mix of storytelling and sharp-eyed observation, Pipher reveals her refreshingly inventive approach to therapy—fiercely optimistic, free of dogma or psychobabble, and laced with generous warmth and practical common sense. Whether she’s recommending daily swims for a sluggish teenager, encouraging a timid husband to become bolder, or simply bearing witness to a bereaved parent’s sorrow, Pipher’s compassion and insight shine from every page. Newly updated with a preface by the author addressing the changes in therapy over the last decade and the surprising challenges of the digital age. Letters to a Young Therapist is a powerfully engaging guide to living a healthy life. 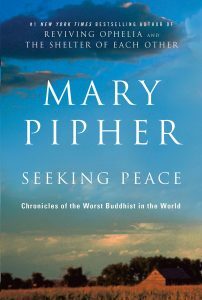 “Mary Pipher takes on our planet’s greatest problems with the skills of a truly gifted therapist. She knows why we avoid and deny the truth and she knows how we can heal ourselves and our communities even as we try to heal the earth. This book is a deep and true gift.” Bill McKibben, author of Earth. Every day we are hit by a tidal wave of information, including a great deal of traumatic information about the fate of Mother Earth. Yet our basic equipment—our bodies and brains—have not changed since the Neolithic Era. We simply are not built to respond well. The Green Boat posits a trauma to transcendence cycle that begins with awareness and leads first to resilient coping and then, in many people, to what I call a transcendent response. As our web of life becomes tattered and torn, it is easy to become disconnected from our emotions, our bodies, each other, and the truth. The Green Boat suggests that we can only be sane and healthy by reconnecting with these things. Healing ourselves will require us to reweave the web of life around us. 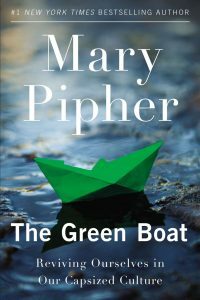 After decades as a psychotherapist and author of such life-changing books as Reviving Ophelia and The Shelter of Each Other, Mary Pipher turns her attention to herself – collecting insights from her own life to illuminate the importance of the journey, not just the destination. In these tumultuous times, don’t we all want to be heard? Who doesn’t want to transform the world? And who doesn’t harbor a secret ambition to write? Writing to Change the World is intended to help people who have a message they’re passionate about to convey it clearly through writing. 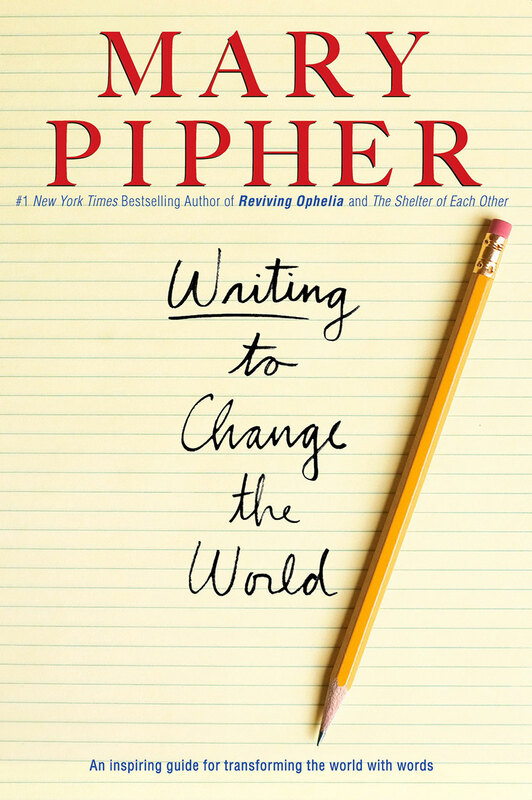 Inspired by a course of the same name that Pipher taught at the University of Nebraska’s National Summer Writers’ Conference, this book encapsulates her years of experience as a writer and therapist, as well as her extensive knowledge of the craft of writing. 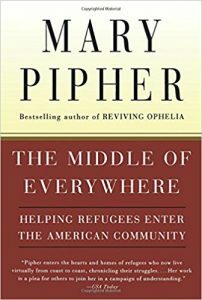 Over the past decade, Mary Pipher has been a great source of wisdom, helping us to better understand our family members. Now she connects us with the newest members of the American family–refugees. They come with nothing but the desire to experience the American dream. Their endurance in the face of tragedy and their ability to hold on to the virtues of family, love, and joy are a lesson for Americans. Their stories will make you laugh and weep and give you a deeper understanding of the wider world in which we live. 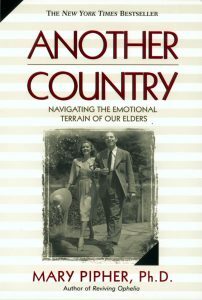 Pipher reveals that the greatest shame for today’s elders, most of whom survived the Depression, is not being self-sufficient. The majority of them stoically prefer to keep their feelings to themselves, and this is why it’s so difficult to convince older parents to accept or even discuss such issues as physical and mental health, finances, eldercare, or living wills. This directly conflicts with the openness of their children, who were influenced by popularization of therapy. While a boomer can easily talk with a friend about marriage or personal difficulties, an elder is likely to find admitting such “weaknesses” abhorrent. Pipher offers new insights into communication across the generations. 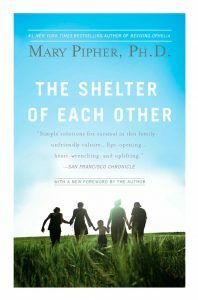 In The Shelter of Each Other, Mary Pipher opens our eyes wide to the desperate realities families are facing and shows us a way out. Drawing on the fascinating stories of families rich and poor, angry and despairing, religious and skeptical, and probing deep into her own family memories and experiences, Pipher clears a path to the strength and energy at the core of family life. Wise, compassionate, and impassioned, The Shelter of Each Other challenges each of us to face the truth about ourselves and to find the courage to protect, nurture, and revivify the families we cherish. When Reviving Ophelia was first published the response was extraordinary. She posed the provocative question: Why are American adolescent girls falling prey to depression, eating disorders, and suicide attempts at an alarming rate? The answer hit a nerve. We live in a look-obsessed, sexist “girl-poisoning” culture. And despite the advances of feminism, girls continue to struggle to find their true selves. Here are girls’ unmuted voices from the front lines of adolescence, personal and painfully honest. 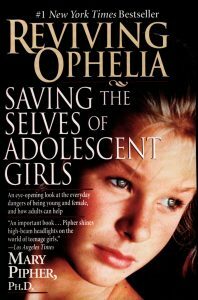 By laying bare their harsh day-to-day reality, Reviving Ophelia issues a call to arms and offers parents compassion, strength, and strategies with which to revive these Ophelias’ lost sense of self. We live in an appearance-obsessed culture. Fashion ads, magazine covers, TV shows, and movies idealize a body type that is impossible for most real women to achieve. 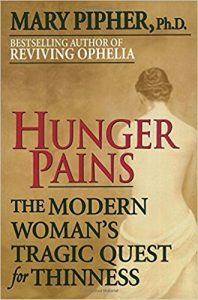 In this comforting, liberating book, Dr. Pipher offers advice, counsel, and practical solutions for understanding our needs, our fears, and our many hungers. She shows us how we can at last learn to live at peace with the natural differences in our bodies and appetites.